Texting leads to conversations, which leads to relationships, business, and better engagement with your contacts. 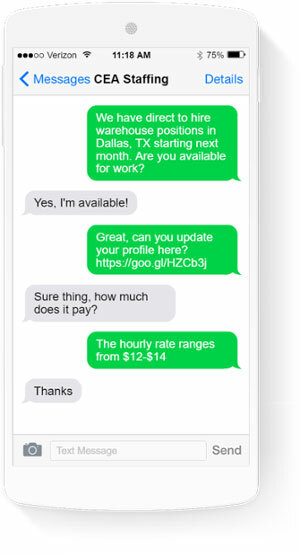 Our text conversations solution enables texting on your business number from any computer. Text from your computer or tablet and keep business text messages off personal phones. Grant access to your account so your team can help manage replies and new conversations. Enable texting on an existing landline or 8xx number w/out affecting calls. Now customers can text you. Each contacts entire message history is available when you access a conversation. Use up to 320 characters. Messages over 160 will use an additional credit. Inbound messages are free! Text groups of up to 15 contacts and send unlimited text conversations with our unlimited 1-to-1 add-on. Get notified via email or text message when your recipients reply to your text conversation. Contacts can reply to your text broadcast with images. Let us text enable your business number so you can start sending text messages to your contacts from a number they recognize. Manage replies, send individual messages, and view message history on your computer with our Text Conversations solution. How can text conversations help you? We know we're not the right fit for everyone. For starters, if you're looking to do marketing, political, or fundraising - then look elsewhere. While not necessarily illegal, we've made a conscious choice only to deliver the types of informational messages that most people don't mind seeing. It's time for your business to start texting. Imagine how many people already have your business number saved on their phone. What if you could enable texting on your local landline number or an existing toll-free number? Think about whether your customers would appreciate being able to send you a text message instead of calling, emailing, or chatting online. More importantly, how would you like to send messages to your contacts from your business number? Call-Em-All can enable text conversations on your existing number, and let you manage messages, contacts, and replies from any computer. Plus, we also provide mass texting and voice broadcasting. More than 50% of consumers prefer text messages on their mobile phones over emails or calls. US smartphone users send and receive five times more texts than they make and receive calls. 78% of consumers say receiving a text message is the fastest way to reach them for necessary service updates. Imagine reaching your contacts faster, eliminating time spent making phone calls or sending emails. You'll always have a history of your conversations to refer too. You can convert contacts into paying customers faster. You can lower call volume by providing customers with a more natural way to get support. You'll be reaching contacts the way they prefer. This can all be yours when you join the Call-Em-All family. Call-Em-All is useful because it’s designed for you, not for marketing or political spam. In the summer of '05, Brad Herrmann, Hai Nguyen, and Stephen Barclay joined forces to start a great company. A company that develops a more meaningful experience for customers, and inspires employees to come to work happy. Our Small Giants philosophy - that there's more to success than the bottom line is what sets us apart and drives everything we do. The result: Since 2005, we've delivered over 1.2 billion voice and text messages. Our customers are fiercely loyal and happy because our employees are passionate about the product and our culture. Conversational texting is an incredibly useful tool when used to deliver urgent or essential messages. Marketing and political usage of mass text messaging can be just as annoying as a robocall which is why we created our responsible use policy. Today, more than 10,000 organizations rely on our automated calling and text messaging services to quickly deliver messages to their contact groups or individuals. The first thing to know about Call-Em-All is getting started is amazingly simple. Most people send their first message seconds after creating their free account. When you create your account, we'll assign you a toll-free number to send text messages from. If you want to text enable a landline or existing toll-free number, our customer experience team can help you with this process. If you need help at any time, free award-winning customer service is a phone call, chat, or an email away. And if you ever have second thoughts, not to worry – on top of your 25 free credits, we offer straightforward pricing plans. Our Monthly plan includes unlimited text messaging (and calling) for one low monthly fee. Pricing is based on the size of your group. This is best when you message the same group of contacts each month. Our Pay-As-You-Go plan lets you pay only for messages you send without a monthly recurring fee. This is best when your contacts change with each message, or if you only plan on sending occasional messages. To send messages you purchase credits ( 1 credit = a call or text), the more credits you purchase, the lower the per credit price. Should you make the switch to Call-Em-All? Yes! Creating an account couldn't be easier. No credit card is required to get started, and there are no long-term contracts - we'll even give you 25 free credits to try out the service. Why switch? The easy answer is that you're going to save so much time, precious time – that Call-Em-All will pay for itself many many many times over. Also, we're a little bit different than most companies you probably do business with, and that has a lot to do with our culture. We're equally passionate about our product and creating meaningful experiences for customers. Call-Em-All is a huge time saver. Don’t spend another month wasting time making phone call after phone call or sending individual text messages. Get started with Call-Em-All today and experience a better way to deliver your message. *Quotes are from actual customers providing feedback via NPS surveys. You're in good company. Join more than 12,000 groups, businesses, and organizations saving time and money. Here are some familiar faces!